Document those magical fairy tale memories with Little Princess! Pretty pinks and purples paired with cute castles, dreamy dragons & pretty princesses create the picture-perfect collection for documenting your little princess. After all, everyone deserves a little happily ever after! This binder is perfect for the Little girl in your life. Join Younique Scrapbook Store for our cardmaking/craft class in Guelph. 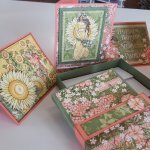 Attention Crafters Join Margie on Monday May 13th and create your own beautiful 6 card box set with the lovely graphic 45 "Garden Goddess" line. Make 6 all occassions cards with envelopes that fit in their own matching card box. Easily used as a gift or keep for yourself. Join Heather and get down and dirty as she helps you to create a 12 x 12 mixed Media board. You will get to play with a plethora of products from Prima including Flowers, metals, chipboard and Finnabair mixed media products. Sunshine & Blue skies are coming and you don't want to miss out on this beautiful summer album to capture those Lazy hazy days. Join Heather as we create a perfect Travelers planner notebook for that special trip you have coming up. Encaustics is an ancient art form that involves fusing layers of oil tinted beeswax together with various heating techniques As the layers are built up, objects can be embedded in the wax and gouging techniques are incorporated to create shapes and designs. Each person will leave with practice boards as well as 1 6x6 wooden panel. In my mosaic stained glass class you will create a piece approx 12x12 inches. I have a few designs that are easy for students that are beginners, tree, flowers, sun and abstract. Murder mystery..a crop to die for.